This image came from a photograph I took in San Francisco. 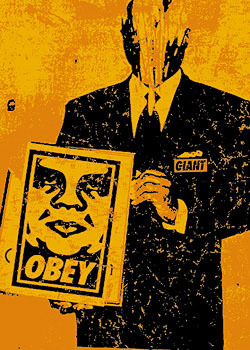 There was a paste-up of a guy in a suit holding a sign, and I pasted one of my 11 x 17” Obey posters over the sign. Someone had already scratched the head of the businessman, which was interesting because I noticed a lot of the Obey images I put up would be scratched immediately. I guess people don’t like to be told to obey, so they react by scratching out the image. In the case of this businessman, someone apparently didn’t like whatever he represented so they scratched him out. I thought it was cool to have the two images combined, since there’s clearly a face associated with Obey but no one sees the face that propagates it.